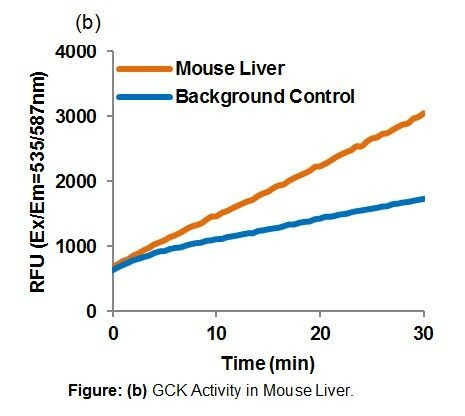 PicoProbe™ Glucokinase Activity Assay Kit (Fluorometric) | K969 | BioVision, Inc.
• Applications-Measurement of Glucokinase activity in various tissues/cells. 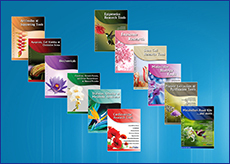 • Analysis of Glucose metabolism and Cell signaling in various cell types. 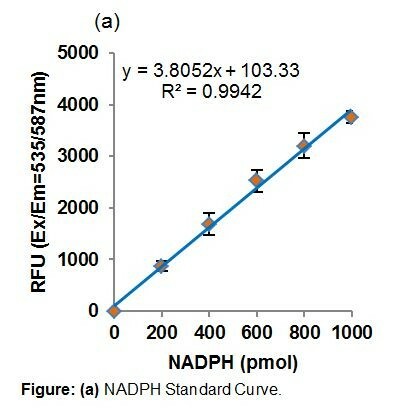 • Measurement of Glucokinase activity in various tissues/cells. Glucokinase (also called GCK, hexokinase type IV or D and ATP: D-hexose 6-phosphotransferase; EC 2.7.1.1) is expressed in specific types of tissues: liver, pancreas, small intestine and brain. Glucokinase functions as a glucose sensor, triggering shifts in carbohydrate metabolism or cell function in response to the levels of glucose in blood, such as nutritional and hormonal molecular pathways. Unlike other Hexokinases, Glucokinase has a relatively low affinity for glucose and it is not inhibited by physiological concentrations of glucose 6-phosphate. Mutations in the gene encoding GCK can cause both hyperglycemia and hypoglycemia. Due to the major role of Glucokinase in controlling blood glucose homeostasis, Glucokinase is currently considered as a strong candidate target for the treatment of Hyperglycemia, a condition encountered in Type 2 Diabetic patients. 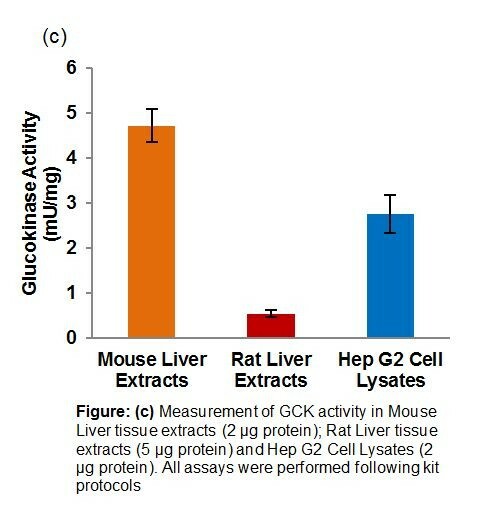 BioVision’s PicoProbe™ Glucokinase Activity Assay Kit provides a quick and easy method for monitoring GCK activity in wide variety of samples. In this assay, GCK converts glucose into glucose-6-phosphate, which in turn is converted into a series of intermediates that reduce PicoProbe™ generating an intense fluorescence product (Ex/Em=535/587nm). The assay is simple, specific, sensitive and high-throughput adaptable and can detect as low as 2 µU of GCK activity.